The Movies & TV app in Windows 10 is similar to the Music app, but is for video instead of music. You can use either app to buy new media as well as play what you have. Select the Movies & TV app on the Start screen. Microsoft designed this app for watching movies purchased at the Microsoft Store and for watching home-made videos. To watch videos, select the Videos button on the menu bar. The Video screen appears, as shown. Use the Video screen to watch videos. Unless you store your videos in the C:\Users\Your Name\Videos folder, you don’t see any videos. You see the message “Tell us where to look for videos.” To tell the Video app where you store your videos, either select the Tell Us Where to Look for Videos link or select the Settings button (you’ll find it in the lower-left corner of the screen) and select the Choose Where We Look for Videos link on the Settings screen. You come to the Build Your Collection screen. 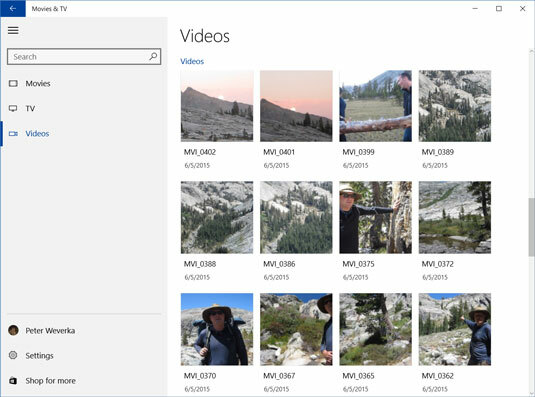 Select the Add button, and in the Select Folder dialog box, select the folder where videos are stored and then select the Add This Folder to Videos button. Repeat these instructions to add all the folders where you store videos. To play a video, select it on the Home screen. It appears in the video player screen, as shown here. Along the bottom of this screen are controls for pausing, playing, and changing the volume level. 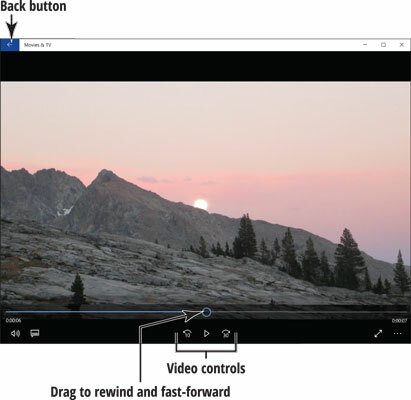 Drag the slider below the video screen to rewind and fast-forward. Select the Back button to return to the Movies & TV home screen.